In just a few days, the HR community will descend upon Las Vegas for the industry’s event of the year: the 14th Annual HR Technology® Conference & Expo. I understand from my good friend Bill Kutik, co-chair of the conference, that registration numbers are through the roof and we can expect record attendance. As our beloved co-CEO Dave Duffield said, “Everybody goes because everyone is there.” It is the one time each year when all of the industry’s top thinkers converge. Dave will be there. So will our other co-CEO—enterprise software maven and all-around wonderful leader Aneel Bhusri. Yes, both will be in the booth. Come and meet them (and the rest of us chickens). The content quality is high. Bill painstakingly selects breakout sessions from a large pool of proposals to develop a thoughtful agenda. He thinks about the conference flow, builds on ideas, avoids redundancy, and keeps it relevant and practical. Also, the keynotes are always entertaining and/or intellectually stimulating. It’s just a solid, no-frills conference that avoids boring banquets and gratuitous events around the edges. Vendors fill the time with private parties that are more targeted and personal (keep reading). Bill generates enthusiasm for the conference all year. For example, the conference’s LinkedIn group, which Bill moderates, is certainly the most active group I stalk on LinkedIn. He also promotes the heck out of the conference on The Bill Kutik Radio Show®, sponsored by Knowledge Infusion. Our own Dave was featured this month. Workday certainly anticipates this event and is busily preparing many different opportunities for you to learn about us, and for us to listen to your business needs. We also plan to have a great deal of fun—it is one of our core values here at Workday. By the way, our customers are fun to hang out with, too. HCM1 Breakout Session: Intuit Transforms HR. Dave Duffield will introduce our AWESOME customer Jennifer Hall, VP of HR for Intuit. Join us at our classy booth (#609). We will be running theater sessions during the times below and will give away $100 gift cards after each presentation. At the booth, you’ll have the opportunity to connect directly with our customers and hear their unvarnished opinions of Workday, including 15-minute presentations by CareFusion, Lenovo, McKee Foods, VeriFone, and Zappos on the benefits they’ve achieved with Workday. There’s no excuse not to stop by, even if you spent hours with us last year. We’ve had three updates—that’s over 450 new features—since last year’s show, and we will be previewing some features from our fall update that you will definitely want in your hands and the hands of your executives ASAP. Demo Sessions. New this year to the show are individual demo rooms off the expo floor. Workday will host two hour-long sessions aptly-titled, “Workday: A Business-First Approach.” During each session, we’ll showcase our unified Human Capital Management solution, and our customers will be there to share their experiences with Workday. And if that’s not enough to grab you, we’re also giving away a PlayStation 3 after Monday’s session and a $250 Zappos gift card on Tuesday. High-end swag. Party at the Mix Lounge! 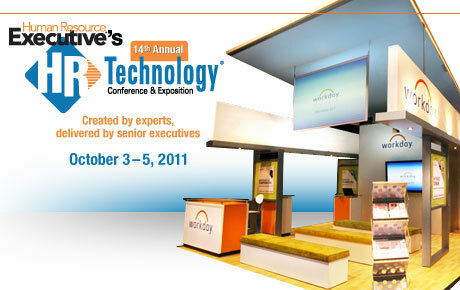 Stop by Workday booth #609 if you would like a personal invitation to our party on Monday evening. Please, don’t feel uncomfortable asking. Again, we like people who value fun (and recognize the value of software in the cloud). Awesome New Technologies, taking place Tuesday from 4:00 – 5:15 p.m. Workday for iPad™ will be one of six solutions featured in this popular session. Our co-CEO Aneel Bhusri will be demoing Workday for iPad, a natively built mobile solution designed specifically for executives. It’s truly awesome! So when your boss asks you what you learned in Vegas, don’t miss the opportunity to share what we are up to at Workday. If your boss is at the top of his or her game, they will likely ask more about next-generation alternatives to the stuff you’ve got now. We hope to see you and get to know you at the show!